Home » Community Happenings » We’re so thankful for volunteer groups – like Catholic University’s student chapter of the Green Building Council! We’re so thankful for volunteer groups – like Catholic University’s student chapter of the Green Building Council! From the beginning, Community Forklift has been lucky to have many generous, hardworking individuals who volunteer their time here. But recently, we’ve also been hosting more volunteer groups! Our 2014 calendar is filling up already, so if you’re looking for a service project for your employees, social club, singles group, sports league, or college class, get in touch with us soon at Outreach(at)CommunityForklift.org. It’s always super helpful to have a bunch of volunteers descend on the warehouse for a day. When a group sorts donations or cleans up an area, it’s easier for customers to find what they need. This means that more people choose to reuse, turning more “trash” into treasure for the local community. For example, when our proceeds increase, we can expand our HELP program to provide more free supplies to nonprofits and families in need! Not only are these events very important for Community Forklift, but the volunteers tell us they really enjoy it – it’s a great team-building activity. “CUA-USGBC is a student organization at The Catholic University of America, which aims to help students learn about sustainability through service projects and hands-on green building experiences. As a student group on the United States Green Building Council, we hope to be able to learn about sustainable practices, especially those involved in architecture, and to try to benefit the community through projects and events. We are all architecture students, and we received word of Community Forklift through classmates who had gotten materials there, as well as from our faculty advisor who informed us of the organization’s need for volunteers. 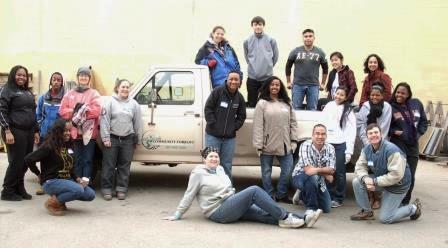 A number of our members volunteered at Community Forklift this past December. As it was our first time visiting, we were given a tour during which we learned not only about what is available to purchase, but also about how each section of the warehouse is able to benefit the community. 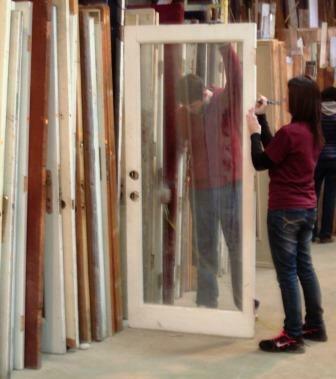 During our time there we helped to re-organize and measure the windows that had been donated. Making the windows easier to search through can help to make choosing the correct window much easier for a shopper, meaning that more of the donated windows will be reused. We’re looking forward to it too! We’ve got a lot of fun volunteer groups scheduled this spring, including an event for single Forklift Fans (more info coming soon). If you’d like to sign up your company, club, or student group, or you have more questions, please get in touch with us at Outreach(at)CommunityForklift.org.